If you’re interested in Southern Unionism, especially within the Lone Star State, the upcoming symposium will be of great interest to you. Lots of great scholars and papers, and I’m honored to be included. My talk will be on Warren Jacob Collins, leader of the Unionist “Jayhawkers” of the East Texas Big Thicket. Warren was part of a Unionist family that included Jasper Collins of Mississippi, a member of the Knight Company of “Free State of Jones” fame. Support for the Union in Texas and rejection of the Confederacy did not solely consist of Sam Houston’s famous refusal to take oath of allegiance to the Confederacy. Before, during, and after the Civil War, significant numbers of Texans of all social, economic, and ethnic groups actively opposed the dominant southern slaveocracy for a variety of reasons. 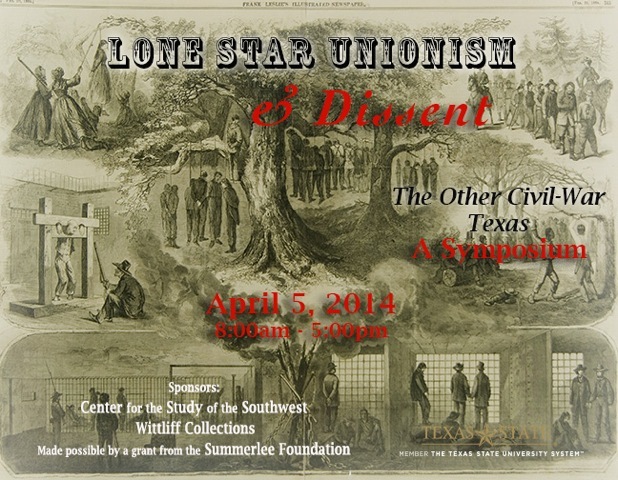 This symposium explores the diversity of that opposition and challenges the myth of a monolithic pro-Confederate Texas. Presented by Texas State’s Center for the Study of the Southwest, this all-day symposium offers two morning sessions and one afternoon session of three presentations each, followed by keynote address and a Q&A period. The “collective memory” of Confederate Texas is as elusive as a ghost. It is as lacking in definite shape as any restless spirit, and tracing manifestations of it is a challenge worthy of any ghost hunter. This nebulousness, like so many aspects of Texas history and memory, is inextricably linked with Texan identity, in itself a loaded term. From a survey of primary and secondary sources, however, a few conclusions emerge, the first and foremost of which is that Texans viewed and many continue to view themselves as “Texan” first and foremost. A second is that vast differences of geography and ethnic heritage mitigated against the formation of a genuinely “collective” memory of a Confederate Texas. A third is that Texas men were much more interested in getting back to making money than they were in memorializing a lost cause. This left the cultivation of “memory” to the ladies. McLemore explores the evidence for and the nature of collective memory of Confederate Texas through time. This presentation will focus on the problem that slave fight posed for Anglo Texans and Confederates, as enslaved people during the 1850s and 1860s escaped from plantations. The position of Texas along the far-western frontier of the American South, alongside Mexico, presented unique opportunities for enslaved people to flee their masters, leaving the state’s planters particularly concerned about the problem of slave flight and rebellion. The outbreak of the Civil War threatened to destabilize slaveholding in the state as it brought new opportunities for Texas slaves to escape, even as slaveholders from other parts of the Confederacy began shuttling slaves into Texas to isolate them from Union armies (and the opportunity to run to freedom across Union lines). Dr. Torget will examine both how the course of the war affected slave escapes in the state, and how Anglo Texans thought about both the threat of emancipation and the central problem that their enslaved servants posed: unionists in their midst. As Union armies occupied New Orleans and moved up the Mississippi River in late 1862 and 1863, slaveholding refugees from Louisiana poured across the border into Texas, bringing with them tens of thousands of enslaved people. As these slaveholders rented land, hired out slaves, moved back and forth across the border, and sometimes straddled the line between commitment to the Confederacy and grudging acceptance of Union gains, their presence created tensions with many native Texans who questioned their loyalty or feared the influx of “strange” people of color. As “outsiders” who were neither Unionists nor fully accepted by Confederate Texans, these refugees and the enslaved people they brought with them did not always fit neatly into the categories historians have used to understand wartime Texas. They reveal the heterogeneous and shifting nature of the state’s population as well as the multiple motives—economic, practical, familial, and ideological—that brought many strangers to Texas during the War. Texas, which was home to more than a quarter of Germans residing in the eleven Confederate states, was the only place with an appreciable rural German element, one that was large enough to play a role in politics and war. Just what role they played, however, still remains under dispute. In the popular media, various characterizations of Germans have portrayed them as everything from “fire-breathing secessionists” to “virtually all Unionists.” The range of scholarly opinion is nearly as broad. Older accounts often reflect the characterization of antebellum traveler Frederick Law Olmstead, portraying Germans as largely abolitionist in sentiment. More recent scholarship has cautioned against generalizing from a few radical Forty-eighters to the bulk of ordinary German immigrants. Kamphoefnel re-examines the role and attitudes of Texas Germans (and smaller continental European groups often allied with them) toward slavery, the Confederacy, and Reconstruction, drawing particularly on evidence from letters and from voter behavior. It also explores personal factors which made individuals more or less sympathetic to the Confederate cause. Mexican Texan resistance to the Confederacy and Tejano Unionism along the South Texas border will be examined by Valerio-Jiménez. He argues that Mexican Texans’ reactions to the U.S. Civil War were rooted in the relationships Mexicans had established with African Americans in the villas del norte (towns along the Rio Grande) during the Spanish and Mexican periods. Following U.S. annexation, Tejanos assisted runaway slaves who sought freedom in Mexico and they also intermarried with African Americans. The paper demonstrates that Mexican Texans who joined the Union Army did so for various reasons including anti-slavery sentiment, opposition to pro-Confederate local politicians, and expressions of U.S. citizenship. Although they endured hardships during the war and were not politically rewarded afterwards, Tejanos invoked their military service as a claim to U.S. citizenship. Immediately following the Civil War in 1865, African Americans in the former Confederacy faced extremely brutal violence perpetrated by whites. This was particularly true in Texas, a state known during the period for both violence and racial intolerance. Texas has been viewed by Reconstruction scholars as one of the most violent of the former Confederate states. Even so, the violent experience of former slaves in the state has not been fully examined. Although white Texans used violence to injure, kill, or control individuals, violence also served the larger purpose of creating a climate of fear in order to more easily subjugate and control the entire black community. Despite this brutal atmosphere, black Texans risked their lives by reporting acts of violence that occurred in their communities. Kosary examines the testimonies of African Americans as a form of resistance; in testifying to federal officials, black Texans resisted re-subjugation and established a degree of autonomy and power over their own lives. During the Civil War, Warren Jacob Collins of Hardin County, Texas, led a band of guerrillas that hid out in East Texas’s Big Thicket. Collins’s occasional appearance in Texas folklore as a backwoods, bare-knuckled fighter or, alternatively, the “Daniel Boone” of East Texas, has long obscured the deeply-held political views that led him (and six of his brothers) to support the Union against the Confederacy. A careful study of the Texas Collins brothers and the Big Thicket uprising reveals the uprising’s yeoman roots as well as its direct ties to the more famous yeoman uprising in Mississippi known as the “Free State of Jones.” The political postwar evolution of Warren J. Collins in turn provides a window on connections between Southern Unionism and the rise of third party challenges to the Democratic Party. Despite popular lore that tends to focus on events reinforcing common perceptions of Texan exceptionalism and virtues—which leads many Texans to assume their state emerged from the Civil War virtually unscathed—facts reveal many regions were deeply scarred by wartime experiences, and the violence did not come from invasions. Confederate Texans proved just as intolerant of dissenters as Southerners in many other states, and they reacted just as violently to internal challenges. North Texas became the arena for many brutal operations against Unionists, which undermine claims of both exceptionalism and virtue by Texans concerning the Civil War. Instead, residents of the Lone Star State, like Southerners who lived elsewhere in the former Confederacy, had to reflect on a divided legacy that included not just the heroism of units such as Hood’s Texas Brigade, but also the viciousness of events such as the Great Hanging at Gainesville. Occupying Union troops entered Texas in June more than two months after the Civil war had ended, but it was on June 19 (Juneteenth) that a portion of the 250,000 slaves—the last within the Confederacy—learned of their freedom. The emancipation announcement, made by General Gordon Granger in Galveston, tested the resolve of slavery supporters and began in earnest the development of a freedom tradition that has lasted to this day. During Juneteenth’s evolution from 1865 to the turn of the century, black communities came together annually to celebrate their liberation and to honor the president who had freed them. Over time, leaders and social justice activists used Juneteenth gatherings as a pragmatic way not only to remember with pride black state office holders but also to launch important goals for African Americans. The creation of Reconstruction government demonstrated that democracy could be carried out by a black and white voting populace, a memory that would later be suppressed by whites seeking to disfranchise black voters. As Reconstruction faded and Redeemers returned to state office, African Americans, through Juneteenth celebrations, kept alive the meaning of freedom, the history of their political participation, and the quest for full citizenship under the law. Edmund J. Davis was a prominent Texas politician in the antebellum era who supported the Union in the secession crisis of 1860-1861, fled the state and became a general in the Union Army, then returned after the war to become an important figure in the state’s Republican Party and ultimately the state’s governor. In the latter position he urged a new course for Texas, even supporting full rights for the state’s newly freed slaves. Moneyhon examines Davis’s course during these years, assessing the causes for the decisions he made. This examination shows, ultimately, the plight of an individual whose constitutional and legal views precluded his endorsement of the actions of the state’s Democratic majority. It illustrates how the uncompromising stance of the latter and their refusal to tolerate any wavering on the issue of secession and their justification of it following Confederate defeat forced unwanted decisions on a fundamentally conservative man. The fanatical position held by the Democratic leadership, in the end, radicalized Davis and accounts for the emergence of an individual willing to challenge their leadership and even the socio-economic status quo in Texas. I just read the first of your books and can not wait to read the rest. I undetstand you did research in Montgomery County, NC and wondered if any of it spilled over into neighboring Stanly County. They were one county until 1841. Hello Daisy. Yes, I have done extensive research on Montgomery County, NC, not only for my first book, Unruly Women, but also for my latest, Long Shadow of the Civil War. My research into Montgomery County includes much more on neighboring Randolph and Moore Counties rather than Stanly, however, because of the political dissent during the Civil War that spilled over those three county borders. One of the early communities of Jones County was Hebron, located 14 miles north of Laurel, MS. One of the first settlers in the community was Jackie Knight grandfather of Newt Knight. Arriving at Leaf River he decided to settle here, building a log house in the wilderness and buried his treasures. With the coming of other settlers a church, school and Masonic Lodge sprang up and the place became known as Bethel. The name was later changed to Reddoch or Reddoch’s Ferry, then to Fuller when a post office was secured. After the post office closed the place took the name of Hebron for the Hebron Methodist Church. Another early community of Jones County was Sandersville. Located eight miles northeast of laurel, the early history of Sanderville centers around the families of Ferguson, Smith and Sanders. In 1831, the Smith brothers moved to Jones County from Scotland by way of Wayne County. Settling on farms in what was later to become Sanderville, they found the Ferguson family already living there. In 1852, Robert Sanders, for whom the town was named, moved there with his family, settling a few yards back of where the D.R. Sanders home was later located. In 1882 or 1883, the railroad was built through the town, sawmills were established and in 1886 the first turpentine still in the section was operated by W.H. Patton. The railroad opened a new trade territory and shipping center, with other industries being opened from time to time until the depression forced them to close. Sandersville was incorporated in 1854. Among the other early communities of Jones County were Eastabutchie, Good Hope and Old Ellisville. The first known families in the county carried names such as Collins, Bush, Wade, Welch, Musgrove, Loper, Powell, Parker, Ellis, Anderson, Walters, Knight, Kilgore, Smith, Shows, Welborn, Blackledge, Holified, Ellzey, Bridges and Evans. Jasper Collins was one of the first known settlers, possibly the first, and he came in 1775. The family name of Collins has played a large part in the history of the county even until the present day. My question is do you know how I could find page 8 of this article and how I could find a copy of the First in a series of the “Early settlers left their mark on Jones County settlements”? Would appreciate any assistance or recommendation in finding this information. Hi, Jan, it’s great to hear from you after all this time! I’m sorry, but I can’t answer your question about how to find page 8 of the article you quoted from, above. It sounds like material from the county’s WPA narratives that someone has compiled and published. I would like to correct an error contained within: Jasper Collins most assuredly was not in Jones County by 1775, and neither was his father Stacy. Those kinds of errors make me think even more that this may be from the WPA interviews of the 1930s, which contains many such errors. I’ll give a look at my WPA files and see if anything like this pops up. Some of my family and I will be attending this weekends’ symposium! We very much are looking forward to attending and hearing you speak! We are descendants of Morgan Columbus Collins of Mississippi/E. Texas through his son John Bruce Collins. We missed your last event when you were in Texas and are very excited to finally make it! Hey, that’s great! Be sure and introduce yourself to me when you get the chance. See you soon! Thanks to “howdygal” and all the descendants of Morgan Columbus Collins and Simeon Collins who attended the symposium–it was so nice to meet you all!